* The MLRS is a tracked vehicle containing twelve missiles designed to deliver a large quantity of munitions into an area in a short time. The primary mission is the suppression of enemy air defenses and counterfire against fixed targets. 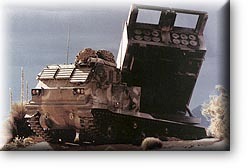 The MLRS system is used by a number of our European allies in their military forces. It fires an M77 rocket in a six-round pod. The rocket warhead contains 644 fual purpose grenades for lightly armored systems and personnel. One MLRS M77 rocket can dispense its grenades over four to five acres. If the launcher was to fire all of its load of 12 rockets, the target area coverage would be 30 acres. It can also fire the Army Tactical Missile System (ATACMS) which is used as a deep strike against soft, stationary and semi-fixed targets. The BM-21 is a multiple rocket launching system based on a variety of chassis but most often seen on a cross-country truck. It carries 40 missiles with a small warhead and has a range of about 12 miles. Iraqi's also used the Astros II multiple rocket launcher which had a range of 60 kilometers. The MLRS was used in preparatory attacks on Iraqi front line units before the ground war. Using a variety of munitions, including scatterable anti-tank mines, the MLRS systems were in operation with U.S. and British units. MLRS was also used to suppress enemy artillery that was causing problems for allied front line troops prior to the ground war. ATACMS were used against air defense sites. 189 MLRS were deployed to the theater. The MLRS fired 9,660 rockets.